Coming hard on the heels of Dialog's acquisition of Atmel and Western Digital acquiring SanDisk, Microsemi wants to acquire PMC-Sierra in a $2.4bn deal that highlights the accelerating consolidation in the embedded industry. This consolidation is somewhat hidden by the tech bubble involving software and apps, but highlights the change in the semiconductor cycle into a downturn. The industry avoided taking too much of a hit in 2008 as the semiconductor cycle was at its peak, but the current cycle is set to coincide with the bursting of the tech bubble. ," said Microsemi. This deal in particular is a sign of the peak of the cycle, as PMC-Sierra was set to acquire Skyworks, and the current deal aims to change that. This is the same kind of deal that happened at the peak of the property market in the UK, where a buyer comes in with a higher offer, called gazumping. The PMC deal is valued at $11.50 per PMC share, representing a premium of approximately 50 percent to the closing price on October 5th, 2015, the last trading day prior to the announcement of PMC's proposed acquisition with Skyworks. Microsemi believes its $2.4bn cash and stock proposal would provide PMC shareholders with a substantial premium and immediate cash value, as well as the opportunity to participate in the significant upside potential of a global analogue and mixed-signal leader with a highly diversified platform for growth and profitability. "Based on extensive discussions with PMC over the past 18 months and comprehensive analysis, we believe this transaction offers compelling strategic and financial benefits for the shareholders of both Microsemi and PMC," said James J. Peterson, Microsemi's chairman and CEO. "This acquisition will provide Microsemi with a leading position in high performance and scalable storage solutions targeted for data center and cloud applications, while also adding a complementary portfolio of high-value communications products.Microsemi has a strong track record of integrating acquisitions and driving profitability, and we will benefit from increased scale, industry-leading margins, diversified market exposure, consolidated infrastructure and substantial cost savings in a combination with PMC." The transaction with Microsemi will only be subject to domestic regulatory approvals (as opposed to approvals by foreign government entities including China, which is required under the Skyworks merger agreement and likely to result in additional uncertainty and delays) and customary closing conditions, as well as the approval of PMC's shareholders. This comes as Qualcomm absorbs Cambridge Silicon Radio (CSR) after last years acquisition, Dialog bids to acquire Atmel for $4.6bn and Western Digital looks to take over SanDisk. The $19bn SanDisk deal allows WD to use the silicon and embedded software for solid state disk drives, particularly for the data centre. This comes hot on the heels of the $67bn acquisition of enterprise drive supplier EMC by Dell. AMD is making another move into the embedded market with its latest Merlin Falcon system on chip. This time the company has integrated the south bridge into the chip to include all the I/O support and reduce the footprint in embedded designs. The company has also paid attention to security, adding an ARM Cortex A50 processor with ARM's TrustZone technology to provide the start of a secure chain for connecting to the Internet. It is also qualifying parts for the higher temperature range needed for embedded and industrial applications. 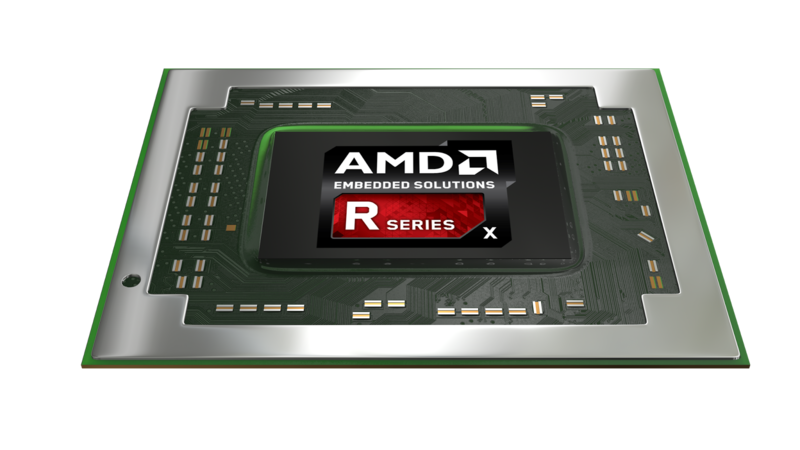 The Embedded R-Series SOC processors include third generation Radeon graphics processor units (GPUs), aiming at small form factor boards for graphic-intensive and video applications, particularly in commercial gaming systems and medial applications. The GPUs allow a hardware-enabled H.265 (HEVC) decoder and DirectX 12 to be used for 4K video. The family uses newest AMD 64-bit x86 CPU core, called Excavator, along with a new approach to power management for reduced energy consumption. This allows the processor to 'move' functions between the GPUs and the processor to keep the device within a specified power envelope. This envelope is between 12W and 35W in 1W steps to keep the cost of thermal management to a minimum. The ARM core supports a secure boot with AMD Hardware Validated Boot (HVB) and initiates trusted boot environment before starting the x86 cores. The device is also designed for the industry's unified memory architecture that shares the memory between the CPU and GPUs, making application development (and the power management) easier. The devices have the first Heterogeneous Systems Architecture (HSA) 1.0 certification, and support for the latest dual channel ECC DDR4-2400 memory as well as existing DDR3-2133 designs so that sysems can be easily upgraded for higher performance in the future. Customers in several industries such as machine learning, medical imaging and digital signage often need to execute compute intensive, parallel processing algorithms, and HSA is a standardized platform design that allows the GPU to be used as a parallel compute engine. This allows developers to more easily and efficiently apply the hardware resources in today's SoCs, enabling applications to run faster and at lower power across a range of computing platforms. "With so much momentum around immersive experiences, especially for visual and parallel computing, the embedded industry needs a high-performance, low-power and efficient architecture with superior graphics and compute capabilities," said Scott Aylor, corporate vice president and general manager, AMD Embedded Solutions. "The Embedded R-Series SOC is a strong match for these needs in a variety of industries including digital signage, retail signage, medical imaging, electronic gaming machines, media storage, and communications and networking." 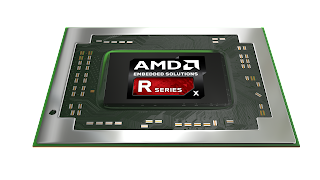 The R-Series SOCs offer 22 percent improved GPU performance over the second generation AMD Embedded R-Series APU and AMD claims to have a 58 percent advantage against the Intel's Broadwell Core i7 when running graphics-intensive benchmarks. AMD will support the Embedded R-Series SOC through the next ten years, and the processors support Microsoft Windows 7, Windows Embedded 7 and 8 Standard, Windows 8.1, Windows 10, and AMD's all-open Linux driver including Mentor Embedded Linux from Mentor Graphics and their Sourcery CodeBench IDE development tools. Developers can also use the Yocto Linux project versions.